The field of AI research was founded at a workshop held on the campus of Dartmouth College during the summer of 1956. Those who attended would become the leaders of AI research for decades. Many of them predicted that a machine as intelligent as a human being would exist in no more than a generation and they were given millions of dollars to make this vision come true. Eventually, it became obvious that they had grossly underestimated the difficulty of the project. In 1973, in response to the criticism from James Lighthill and ongoing pressure from congress, the U.S. and British Governments stopped funding undirected research into artificial intelligence, and the difficult years that followed would later be known as an "AI winter". Seven years later, a visionary initiative by the Japanese Government inspired governments and industry to provide AI with billions of dollars, but by the late 80s the investors became disillusioned by the absence of the needed computer power (hardware) and withdrew funding again. Investment and interest in AI boomed in the first decades of the 21st century, when machine learning was successfully applied to many problems in academia and industry due to the presence of powerful computer hardware. Mechanical men and artificial beings appear in Greek myths, such as the golden robots of Hephaestus and Pygmalion's Galatea. In the Middle Ages, there were rumors of secret mystical or alchemical means of placing mind into matter, such as Jābir ibn Hayyān's Takwin, Paracelsus' homunculus and Rabbi Judah Loew's Golem. By the 19th century, ideas about artificial men and thinking machines were developed in fiction, as in Mary Shelley's Frankenstein or Karel Čapek's R.U.R. (Rossum's Universal Robots), and speculation, such as Samuel Butler's "Darwin among the Machines." AI has continued to be an important element of science fiction into the present. Realistic humanoid automatons were built by craftsman from every civilization, including Yan Shi,Hero of Alexandria,Al-Jazari , Pierre Jaquet-Droz, and Wolfgang von Kempelen. The oldest known automatons were the sacred statues of ancient Egypt and Greece. The faithful believed that craftsman had imbued these figures with very real minds, capable of wisdom and emotion—Hermes Trismegistus wrote that "by discovering the true nature of the gods, man has been able to reproduce it." Artificial intelligence is based on the assumption that the process of human thought can be mechanized. The study of mechanical—or "formal"—reasoning has a long history. Chinese, Indian and Greek philosophers all developed structured methods of formal deduction in the first millennium BCE. Their ideas were developed over the centuries by philosophers such as Aristotle (who gave a formal analysis of the syllogism), Euclid (whose Elements was a model of formal reasoning), al-Khwārizmī (who developed algebra and gave his name to "algorithm") and European scholastic philosophers such as William of Ockham and Duns Scotus. Majorcan philosopher Ramon Llull (1232–1315) developed several logical machines devoted to the production of knowledge by logical means; Llull described his machines as mechanical entities that could combine basic and undeniable truths by simple logical operations, produced by the machine by mechanical meanings, in such ways as to produce all the possible knowledge. Llull's work had a great influence on Gottfried Leibniz, who redeveloped his ideas. 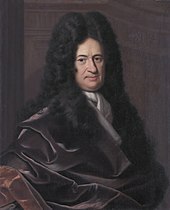 In the 17th century, Leibniz, Thomas Hobbes and René Descartes explored the possibility that all rational thought could be made as systematic as algebra or geometry.Hobbes famously wrote in Leviathan: "reason is nothing but reckoning".Leibniz envisioned a universal language of reasoning (his characteristica universalis) which would reduce argumentation to calculation, so that "there would be no more need of disputation between two philosophers than between two accountants. For it would suffice to take their pencils in hand, down to their slates, and to say each other (with a friend as witness, if they liked): Let us calculate." These philosophers had begun to articulate the physical symbol system hypothesis that would become the guiding faith of AI research. In the 20th century, the study of mathematical logic provided the essential breakthrough that made artificial intelligence seem plausible. The foundations had been set by such works as Boole's The Laws of Thought and Frege's Begriffsschrift. Building on Frege's system, Russell and Whitehead presented a formal treatment of the foundations of mathematics in their masterpiece, the Principia Mathematica in 1913. Inspired by Russell's success, David Hilbert challenged mathematicians of the 1920s and 30s to answer this fundamental question: "can all of mathematical reasoning be formalized?" His question was answered by Gödel's incompleteness proof, Turing's machine and Church's Lambda calculus. The ENIAC, at the Moore School of Electrical Engineering. This photo has been artificially darkened, obscuring details such as the women who were present and the IBM equipment in use. Their answer was surprising in two ways. First, they proved that there were, in fact, limits to what mathematical logic could accomplish. But second (and more important for AI) their work suggested that, within these limits, any form of mathematical reasoning could be mechanized. The Church-Turing thesis implied that a mechanical device, shuffling symbols as simple as 0 and 1, could imitate any conceivable process of mathematical deduction. The key insight was the Turing machine—a simple theoretical construct that captured the essence of abstract symbol manipulation. This invention would inspire a handful of scientists to begin discussing the possibility of thinking machines. 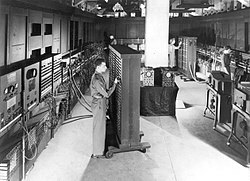 The first modern computers were the massive code breaking machines of the Second World War (such as Z3, ENIAC and Colossus). The latter two of these machines were based on the theoretical foundation laid by Alan Turing and developed by John von Neumann. The IBM 702: a computer used by the first generation of AI researchers. In the 1940s and 50s, a handful of scientists from a variety of fields (mathematics, psychology, engineering, economics and political science) began to discuss the possibility of creating an artificial brain. The field of artificial intelligence research was founded as an academic discipline in 1956. The earliest research into thinking machines was inspired by a confluence of ideas that became prevalent in the late 1930s, 1940s, and early 1950s. Recent research in neurology had shown that the brain was an electrical network of neurons that fired in all-or-nothing pulses. Norbert Wiener's cybernetics described control and stability in electrical networks. Claude Shannon's information theory described digital signals (i.e., all-or-nothing signals). Alan Turing's theory of computation showed that any form of computation could be described digitally. The close relationship between these ideas suggested that it might be possible to construct an electronic brain. Examples of work in this vein includes robots such as W. Grey Walter's turtles and the Johns Hopkins Beast. These machines did not use computers, digital electronics or symbolic reasoning; they were controlled entirely by analog circuitry. Walter Pitts and Warren McCulloch analyzed networks of idealized artificial neurons and showed how they might perform simple logical functions. They were the first to describe what later researchers would call a neural network. One of the students inspired by Pitts and McCulloch was a young Marvin Minsky, then a 24-year-old graduate student. In 1951 (with Dean Edmonds) he built the first neural net machine, the SNARC.Minsky was to become one of the most important leaders and innovators in AI for the next 50 years. In 1950 Alan Turing published a landmark paper in which he speculated about the possibility of creating machines that think. He noted that "thinking" is difficult to define and devised his famous Turing Test. If a machine could carry on a conversation (over a teleprinter) that was indistinguishable from a conversation with a human being, then it was reasonable to say that the machine was "thinking". This simplified version of the problem allowed Turing to argue convincingly that a "thinking machine" was at least plausible and the paper answered all the most common objections to the proposition. The Turing Test was the first serious proposal in the philosophy of artificial intelligence. In 1951, using the Ferranti Mark 1 machine of the University of Manchester, Christopher Strachey wrote a checkers program and Dietrich Prinz wrote one for chess. Arthur Samuel's checkers program, developed in the middle 50s and early 60s, eventually achieved sufficient skill to challenge a respectable amateur. Game AI would continue to be used as a measure of progress in AI throughout its history. When access to digital computers became possible in the middle fifties, a few scientists instinctively recognized that a machine that could manipulate numbers could also manipulate symbols and that the manipulation of symbols could well be the essence of human thought. This was a new approach to creating thinking machines. The years after the Dartmouth conference were an era of discovery, of sprinting across new ground. The programs that were developed during this time were, to most people, simply "astonishing": computers were solving algebra word problems, proving theorems in geometry and learning to speak English. Few at the time would have believed that such "intelligent" behavior by machines was possible at all. Researchers expressed an intense optimism in private and in print, predicting that a fully intelligent machine would be built in less than 20 years. Government agencies like DARPA poured money into the new field. Many early AI programs used the same basic algorithm. To achieve some goal (like winning a game or proving a theorem), they proceeded step by step towards it (by making a move or a deduction) as if searching through a maze, backtracking whenever they reached a dead end. This paradigm was called "reasoning as search". The principal difficulty was that, for many problems, the number of possible paths through the "maze" was simply astronomical (a situation known as a "combinatorial explosion"). Researchers would reduce the search space by using heuristics or "rules of thumb" that would eliminate those paths that were unlikely to lead to a solution. Newell and Simon tried to capture a general version of this algorithm in a program called the "General Problem Solver". Other "searching" programs were able to accomplish impressive tasks like solving problems in geometry and algebra, such as Herbert Gelernter's Geometry Theorem Prover (1958) and SAINT, written by Minsky's student James Slagle (1961). Other programs searched through goals and subgoals to plan actions, like the STRIPS system developed at Stanford to control the behavior of their robot Shakey. An important goal of AI research is to allow computers to communicate in natural languages like English. An early success was Daniel Bobrow's program STUDENT, which could solve high school algebra word problems. A semantic net represents concepts (e.g. "house","door") as nodes and relations among concepts (e.g. "has-a") as links between the nodes. The first AI program to use a semantic net was written by Ross Quillian and the most successful (and controversial) version was Roger Schank's Conceptual dependency theory. Joseph Weizenbaum's ELIZA could carry out conversations that were so realistic that users occasionally were fooled into thinking they were communicating with a human being and not a program. But in fact, ELIZA had no idea what she was talking about. She simply gave a canned response or repeated back what was said to her, rephrasing her response with a few grammar rules. ELIZA was the first chatterbot. In the late 60s, Marvin Minsky and Seymour Papert of the MIT AI Laboratory proposed that AI research should focus on artificially simple situations known as micro-worlds. They pointed out that in successful sciences like physics, basic principles were often best understood using simplified models like frictionless planes or perfectly rigid bodies. Much of the research focused on a "blocks world," which consists of colored blocks of various shapes and sizes arrayed on a flat surface. This paradigm led to innovative work in machine vision by Gerald Sussman (who led the team), Adolfo Guzman, David Waltz (who invented "constraint propagation"), and especially Patrick Winston. At the same time, Minsky and Papert built a robot arm that could stack blocks, bringing the blocks world to life. The crowning achievement of the micro-world program was Terry Winograd's SHRDLU. It could communicate in ordinary English sentences, plan operations and execute them. 1958, H. A. Simon and Allen Newell: "within ten years a digital computer will be the world's chess champion" and "within ten years a digital computer will discover and prove an important new mathematical theorem." 1965, H. A. Simon: "machines will be capable, within twenty years, of doing any work a man can do." 1967, Marvin Minsky: "Within a generation ... the problem of creating 'artificial intelligence' will substantially be solved." 1970, Marvin Minsky (in Life Magazine): "In from three to eight years we will have a machine with the general intelligence of an average human being." In June 1963, MIT received a $2.2 million grant from the newly created Advanced Research Projects Agency (later known as DARPA). The money was used to fund project MAC which subsumed the "AI Group" founded by Minsky and McCarthy five years earlier. DARPA continued to provide three million dollars a year until the 70s.DARPA made similar grants to Newell and Simon's program at CMU and to the Stanford AI Project (founded by John McCarthy in 1963). Another important AI laboratory was established at Edinburgh University by Donald Michie in 1965. These four institutions would continue to be the main centers of AI research (and funding) in academia for many years. The money was proffered with few strings attached: J. C. R. Licklider, then the director of ARPA, believed that his organization should "fund people, not projects!" and allowed researchers to pursue whatever directions might interest them. This created a freewheeling atmosphere at MIT that gave birth to the hacker culture, but this "hands off" approach would not last. In Japan, Waseda University initiated the WABOT project in 1967, and in 1972 completed the WABOT-1, the world's first full-scale intelligent humanoid robot, or android. Its limb control system allowed it to walk with the lower limbs, and to grip and transport objects with hands, using tactile sensors. Its vision system allowed it to measure distances and directions to objects using external receptors, artificial eyes and ears. And its conversation system allowed it to communicate with a person in Japanese, with an artificial mouth. In the 1970s, AI was subject to critiques and financial setbacks. AI researchers had failed to appreciate the difficulty of the problems they faced. Their tremendous optimism had raised expectations impossibly high, and when the promised results failed to materialize, funding for AI disappeared. At the same time, the field of connectionism (or neural nets) was shut down almost completely for 10 years by Marvin Minsky's devastating criticism of perceptrons. Despite the difficulties with public perception of AI in the late 70s, new ideas were explored in logic programming, commonsense reasoning and many other areas. In the early seventies, the capabilities of AI programs were limited. Even the most impressive could only handle trivial versions of the problems they were supposed to solve; all the programs were, in some sense, "toys". AI researchers had begun to run into several fundamental limits that could not be overcome in the 1970s. Although some of these limits would be conquered in later decades, others still stymie the field to this day. Limited computer power: There was not enough memory or processing speed to accomplish anything truly useful. For example, Ross Quillian's successful work on natural language was demonstrated with a vocabulary of only twenty words, because that was all that would fit in memory. Hans Moravec argued in 1976 that computers were still millions of times too weak to exhibit intelligence. He suggested an analogy: artificial intelligence requires computer power in the same way that aircraft require horsepower. Below a certain threshold, it's impossible, but, as power increases, eventually it could become easy. With regard to computer vision, Moravec estimated that simply matching the edge and motion detection capabilities of human retina in real time would require a general-purpose computer capable of 109 operations/second (1000 MIPS). As of 2011, practical computer vision applications require 10,000 to 1,000,000 MIPS. By comparison, the fastest supercomputer in 1976, Cray-1 (retailing at $5 million to $8 million), was only capable of around 80 to 130 MIPS, and a typical desktop computer at the time achieved less than 1 MIPS. Intractability and the combinatorial explosion. In 1972 Richard Karp (building on Stephen Cook's 1971 theorem) showed there are many problems that can probably only be solved in exponential time (in the size of the inputs). Finding optimal solutions to these problems requires unimaginable amounts of computer time except when the problems are trivial. This almost certainly meant that many of the "toy" solutions used by AI would probably never scale up into useful systems. Commonsense knowledge and reasoning. Many important artificial intelligence applications like vision or natural language require simply enormous amounts of information about the world: the program needs to have some idea of what it might be looking at or what it is talking about. This requires that the program know most of the same things about the world that a child does. Researchers soon discovered that this was a truly vast amount of information. No one in 1970 could build a database so large and no one knew how a program might learn so much information. Moravec's paradox: Proving theorems and solving geometry problems is comparatively easy for computers, but a supposedly simple task like recognizing a face or crossing a room without bumping into anything is extremely difficult. This helps explain why research into vision and robotics had made so little progress by the middle 1970s. The frame and qualification problems. AI researchers (like John McCarthy) who used logic discovered that they could not represent ordinary deductions that involved planning or default reasoning without making changes to the structure of logic itself. They developed new logics (like non-monotonic logics and modal logics) to try to solve the problems. The agencies which funded AI research (such as the British government, DARPA and NRC) became frustrated with the lack of progress and eventually cut off almost all funding for undirected research into AI. The pattern began as early as 1966 when the ALPAC report appeared criticizing machine translation efforts. After spending 20 million dollars, the NRC ended all support. In 1973, the Lighthill report on the state of AI research in England criticized the utter failure of AI to achieve its "grandiose objectives" and led to the dismantling of AI research in that country. (The report specifically mentioned the combinatorial explosion problem as a reason for AI's failings. )DARPA was deeply disappointed with researchers working on the Speech Understanding Research program at CMU and canceled an annual grant of three million dollars. By 1974, funding for AI projects was hard to find. Hans Moravec blamed the crisis on the unrealistic predictions of his colleagues. "Many researchers were caught up in a web of increasing exaggeration." However, there was another issue: since the passage of the Mansfield Amendment in 1969, DARPA had been under increasing pressure to fund "mission-oriented direct research, rather than basic undirected research". Funding for the creative, freewheeling exploration that had gone on in the 60s would not come from DARPA. Instead, the money was directed at specific projects with clear objectives, such as autonomous tanks and battle management systems. Several philosophers had strong objections to the claims being made by AI researchers. One of the earliest was John Lucas, who argued that Gödel's incompleteness theorem showed that a formal system (such as a computer program) could never see the truth of certain statements, while a human being could. Hubert Dreyfus ridiculed the broken promises of the 1960s and critiqued the assumptions of AI, arguing that human reasoning actually involved very little "symbol processing" and a great deal of embodied, instinctive, unconscious "know how". John Searle's Chinese Room argument, presented in 1980, attempted to show that a program could not be said to "understand" the symbols that it uses (a quality called "intentionality"). If the symbols have no meaning for the machine, Searle argued, then the machine can not be described as "thinking". These critiques were not taken seriously by AI researchers, often because they seemed so far off the point. Problems like intractability and commonsense knowledge seemed much more immediate and serious. It was unclear what difference "know how" or "intentionality" made to an actual computer program. Minsky said of Dreyfus and Searle "they misunderstand, and should be ignored." Dreyfus, who taught at MIT, was given a cold shoulder: he later said that AI researchers "dared not be seen having lunch with me." Joseph Weizenbaum, the author of ELIZA, felt his colleagues' treatment of Dreyfus was unprofessional and childish. Although he was an outspoken critic of Dreyfus' positions, he "deliberately made it plain that theirs was not the way to treat a human being." Weizenbaum began to have serious ethical doubts about AI when Kenneth Colby wrote a "computer program which can conduct psychotherapeutic dialogue" based on ELIZA. Weizenbaum was disturbed that Colby saw a mindless program as a serious therapeutic tool. A feud began, and the situation was not helped when Colby did not credit Weizenbaum for his contribution to the program. In 1976, Weizenbaum published Computer Power and Human Reason which argued that the misuse of artificial intelligence has the potential to devalue human life. A perceptron was a form of neural network introduced in 1958 by Frank Rosenblatt, who had been a schoolmate of Marvin Minsky at the Bronx High School of Science. Like most AI researchers, he was optimistic about their power, predicting that "perceptron may eventually be able to learn, make decisions, and translate languages." An active research program into the paradigm was carried out throughout the 1960s but came to a sudden halt with the publication of Minsky and Papert's 1969 book Perceptrons. It suggested that there were severe limitations to what perceptrons could do and that Frank Rosenblatt's predictions had been grossly exaggerated. The effect of the book was devastating: virtually no research at all was done in connectionism for 10 years. Eventually, a new generation of researchers would revive the field and thereafter it would become a vital and useful part of artificial intelligence. Rosenblatt would not live to see this, as he died in a boating accident shortly after the book was published. Logic was introduced into AI research as early as 1958, by John McCarthy in his Advice Taker proposal. In 1963, J. Alan Robinson had discovered a simple method to implement deduction on computers, the resolution and unification algorithm. However, straightforward implementations, like those attempted by McCarthy and his students in the late 1960s, were especially intractable: the programs required astronomical numbers of steps to prove simple theorems. A more fruitful approach to logic was developed in the 1970s by Robert Kowalski at the University of Edinburgh, and soon this led to the collaboration with French researchers Alain Colmerauer and Philippe Roussel who created the successful logic programming language Prolog. Prolog uses a subset of logic (Horn clauses, closely related to "rules" and "production rules") that permit tractable computation. Rules would continue to be influential, providing a foundation for Edward Feigenbaum's expert systems and the continuing work by Allen Newell and Herbert A. Simon that would lead to Soar and their unified theories of cognition. Critics of the logical approach noted, as Dreyfus had, that human beings rarely used logic when they solved problems. Experiments by psychologists like Peter Wason, Eleanor Rosch, Amos Tversky, Daniel Kahneman and others provided proof. McCarthy responded that what people do is irrelevant. He argued that what is really needed are machines that can solve problems—not machines that think as people do. Among the critics of McCarthy's approach were his colleagues across the country at MIT. Marvin Minsky, Seymour Papert and Roger Schank were trying to solve problems like "story understanding" and "object recognition" that required a machine to think like a person. In order to use ordinary concepts like "chair" or "restaurant" they had to make all the same illogical assumptions that people normally made. Unfortunately, imprecise concepts like these are hard to represent in logic. Gerald Sussman observed that "using precise language to describe essentially imprecise concepts doesn't make them any more precise." Schank described their "anti-logic" approaches as "scruffy", as opposed to the "neat" paradigms used by McCarthy, Kowalski, Feigenbaum, Newell and Simon. In 1975, in a seminal paper, Minsky noted that many of his fellow "scruffy" researchers were using the same kind of tool: a framework that captures all our common sense assumptions about something. For example, if we use the concept of a bird, there is a constellation of facts that immediately come to mind: we might assume that it flies, eats worms and so on. We know these facts are not always true and that deductions using these facts will not be "logical", but these structured sets of assumptions are part of the context of everything we say and think. He called these structures "frames". Schank used a version of frames he called "scripts" to successfully answer questions about short stories in English. Many years later object-oriented programming would adopt the essential idea of "inheritance" from AI research on frames. In the 1980s a form of AI program called "expert systems" was adopted by corporations around the world and knowledge became the focus of mainstream AI research. In those same years, the Japanese government aggressively funded AI with its fifth generation computer project. Another encouraging event in the early 1980s was the revival of connectionism in the work of John Hopfield and David Rumelhart. Once again, AI had achieved success. An expert system is a program that answers questions or solves problems about a specific domain of knowledge, using logical rules that are derived from the knowledge of experts. The earliest examples were developed by Edward Feigenbaum and his students. Dendral, begun in 1965, identified compounds from spectrometer readings. MYCIN, developed in 1972, diagnosed infectious blood diseases. They demonstrated the feasibility of the approach. Expert systems restricted themselves to a small domain of specific knowledge (thus avoiding the commonsense knowledge problem) and their simple design made it relatively easy for programs to be built and then modified once they were in place. All in all, the programs proved to be useful: something that AI had not been able to achieve up to this point. In 1980, an expert system called XCON was completed at CMU for the Digital Equipment Corporation. It was an enormous success: it was saving the company 40 million dollars annually by 1986. Corporations around the world began to develop and deploy expert systems and by 1985 they were spending over a billion dollars on AI, most of it to in-house AI departments. An industry grew up to support them, including hardware companies like Symbolics and Lisp Machines and software companies such as IntelliCorp and Aion. The power of expert systems came from the expert knowledge they contained. They were part of a new direction in AI research that had been gaining ground throughout the 70s. "AI researchers were beginning to suspect—reluctantly, for it violated the scientific canon of parsimony—that intelligence might very well be based on the ability to use large amounts of diverse knowledge in different ways," writes Pamela McCorduck. "[T]he great lesson from the 1970s was that intelligent behavior depended very much on dealing with knowledge, sometimes quite detailed knowledge, of a domain where a given task lay". Knowledge based systems and knowledge engineering became a major focus of AI research in the 1980s. The 1980s also saw the birth of Cyc, the first attempt to attack the commonsense knowledge problem directly, by creating a massive database that would contain all the mundane facts that the average person knows. Douglas Lenat, who started and led the project, argued that there is no shortcut ― the only way for machines to know the meaning of human concepts is to teach them, one concept at a time, by hand. The project was not expected to be completed for many decades. Chess playing programs HiTech and Deep Thought defeated chess masters in 1989. Both were developed by Carnegie Mellon University; Deep Thought development paved the way for Deep Blue. In 1981, the Japanese Ministry of International Trade and Industry set aside $850 million for the Fifth generation computer project. Their objectives were to write programs and build machines that could carry on conversations, translate languages, interpret pictures, and reason like human beings. Much to the chagrin of scruffies, they chose Prolog as the primary computer language for the project. Other countries responded with new programs of their own. The UK began the ₤350 million Alvey project. A consortium of American companies formed the Microelectronics and Computer Technology Corporation (or "MCC") to fund large scale projects in AI and information technology. DARPA responded as well, founding the Strategic Computing Initiative and tripling its investment in AI between 1984 and 1988. A Hopfield net with four nodes. In 1982, physicist John Hopfield was able to prove that a form of neural network (now called a "Hopfield net") could learn and process information in a completely new way. Around the same time, Geoffrey Hinton and David Rumelhart popularized a method for training neural networks called "backpropagation", also known as the reverse mode of automatic differentiation published by Seppo Linnainmaa (1970) and applied to neural networks by Paul Werbos. These two discoveries helped to revive the field of connectionism. The new field was unified and inspired by the appearance of Parallel Distributed Processing in 1986—a two volume collection of papers edited by Rumelhart and psychologist James McClelland. Neural networks would become commercially successful in the 1990s, when they began to be used as the engines driving programs like optical character recognition and speech recognition. The business community's fascination with AI rose and fell in the 1980s in the classic pattern of an economic bubble. The collapse was in the perception of AI by government agencies and investors – the field continued to make advances despite the criticism. Rodney Brooks and Hans Moravec, researchers from the related field of robotics, argued for an entirely new approach to artificial intelligence. The term "AI winter" was coined by researchers who had survived the funding cuts of 1974 when they became concerned that enthusiasm for expert systems had spiraled out of control and that disappointment would certainly follow. Their fears were well founded: in the late 1980s and early 1990s, AI suffered a series of financial setbacks. The first indication of a change in weather was the sudden collapse of the market for specialized AI hardware in 1987. Desktop computers from Apple and IBM had been steadily gaining speed and power and in 1987 they became more powerful than the more expensive Lisp machines made by Symbolics and others. There was no longer a good reason to buy them. An entire industry worth half a billion dollars was demolished overnight. Eventually the earliest successful expert systems, such as XCON, proved too expensive to maintain. They were difficult to update, they could not learn, they were "brittle" (i.e., they could make grotesque mistakes when given unusual inputs), and they fell prey to problems (such as the qualification problem) that had been identified years earlier. Expert systems proved useful, but only in a few special contexts. In the late 1980s, the Strategic Computing Initiative cut funding to AI "deeply and brutally." New leadership at DARPA had decided that AI was not "the next wave" and directed funds towards projects that seemed more likely to produce immediate results. By 1991, the impressive list of goals penned in 1981 for Japan's Fifth Generation Project had not been met. Indeed, some of them, like "carry on a casual conversation" had not been met by 2010. As with other AI projects, expectations had run much higher than what was actually possible. In the late 1980s, several researchers advocated a completely new approach to artificial intelligence, based on robotics. They believed that, to show real intelligence, a machine needs to have a body — it needs to perceive, move, survive and deal with the world. They argued that these sensorimotor skills are essential to higher level skills like commonsense reasoning and that abstract reasoning was actually the least interesting or important human skill (see Moravec's paradox). They advocated building intelligence "from the bottom up." In a 1990 paper, "Elephants Don't Play Chess," robotics researcher Rodney Brooks took direct aim at the physical symbol system hypothesis, arguing that symbols are not always necessary since "the world is its own best model. It is always exactly up to date. It always has every detail there is to be known. The trick is to sense it appropriately and often enough." In the 1980s and 1990s, many cognitive scientists also rejected the symbol processing model of the mind and argued that the body was essential for reasoning, a theory called the embodied mind thesis. The field of AI, now more than a half a century old, finally achieved some of its oldest goals. It began to be used successfully throughout the technology industry, although somewhat behind the scenes. Some of the success was due to increasing computer power and some was achieved by focusing on specific isolated problems and pursuing them with the highest standards of scientific accountability. Still, the reputation of AI, in the business world at least, was less than pristine. Inside the field there was little agreement on the reasons for AI's failure to fulfill the dream of human level intelligence that had captured the imagination of the world in the 1960s. Together, all these factors helped to fragment AI into competing subfields focused on particular problems or approaches, sometimes even under new names that disguised the tarnished pedigree of "artificial intelligence". AI was both more cautious and more successful than it had ever been. On 11 May 1997, Deep Blue became the first computer chess-playing system to beat a reigning world chess champion, Garry Kasparov. The super computer was a specialized version of a framework produced by IBM, and was capable of processing twice as many moves per second as it had during the first match (which Deep Blue had lost), reportedly 200,000,000 moves per second. The event was broadcast live over the internet and received over 74 million hits. In 2005, a Stanford robot won the DARPA Grand Challenge by driving autonomously for 131 miles along an unrehearsed desert trail. Two years later, a team from CMU won the DARPA Urban Challenge by autonomously navigating 55 miles in an Urban environment while adhering to traffic hazards and all traffic laws. In February 2011, in a Jeopardy! quiz show exhibition match, IBM's question answering system, Watson, defeated the two greatest Jeopardy! champions, Brad Rutter and Ken Jennings, by a significant margin. These successes were not due to some revolutionary new paradigm, but mostly on the tedious application of engineering skill and on the tremendous increase in the speed and capacity of computer by the 90s. In fact, Deep Blue's computer was 10 million times faster than the Ferranti Mark 1 that Christopher Strachey taught to play chess in 1951. This dramatic increase is measured by Moore's law, which predicts that the speed and memory capacity of computers doubles every two years. The fundamental problem of "raw computer power" was slowly being overcome. A new paradigm called "intelligent agents" became widely accepted during the 1990s. Although earlier researchers had proposed modular "divide and conquer" approaches to AI, the intelligent agent did not reach its modern form until Judea Pearl, Allen Newell, Leslie P. Kaelbling, and others brought concepts from decision theory and economics into the study of AI. When the economist's definition of a rational agent was married to computer science's definition of an object or module, the intelligent agent paradigm was complete. An intelligent agent is a system that perceives its environment and takes actions which maximize its chances of success. By this definition, simple programs that solve specific problems are "intelligent agents", as are human beings and organizations of human beings, such as firms. The intelligent agent paradigm defines AI research as "the study of intelligent agents". This is a generalization of some earlier definitions of AI: it goes beyond studying human intelligence; it studies all kinds of intelligence. The paradigm gave researchers license to study isolated problems and find solutions that were both verifiable and useful. It provided a common language to describe problems and share their solutions with each other, and with other fields that also used concepts of abstract agents, like economics and control theory. It was hoped that a complete agent architecture (like Newell's SOAR) would one day allow researchers to build more versatile and intelligent systems out of interacting intelligent agents. AI researchers began to develop and use sophisticated mathematical tools more than they ever had in the past. There was a widespread realization that many of the problems that AI needed to solve were already being worked on by researchers in fields like mathematics, economics or operations research. The shared mathematical language allowed both a higher level of collaboration with more established and successful fields and the achievement of results which were measurable and provable; AI had become a more rigorous "scientific" discipline. Russell & Norvig (2003) describe this as nothing less than a "revolution" and "the victory of the neats". Judea Pearl's highly influential 1988 book brought probability and decision theory into AI. Among the many new tools in use were Bayesian networks, hidden Markov models, information theory, stochastic modeling and classical optimization. Precise mathematical descriptions were also developed for "computational intelligence" paradigms like neural networks and evolutionary algorithms. Algorithms originally developed by AI researchers began to appear as parts of larger systems. AI had solved a lot of very difficult problems and their solutions proved to be useful throughout the technology industry, such as data mining, industrial robotics, logistics,speech recognition, banking software, medical diagnosis and Google's search engine. The field of AI received little or no credit for these successes in the 1990s and early 2000s. Many of AI's greatest innovations have been reduced to the status of just another item in the tool chest of computer science. Nick Bostrom explains "A lot of cutting edge AI has filtered into general applications, often without being called AI because once something becomes useful enough and common enough it's not labeled AI anymore." Many researchers in AI in 1990s deliberately called their work by other names, such as informatics, knowledge-based systems, cognitive systems or computational intelligence. In part, this may be because they considered their field to be fundamentally different from AI, but also the new names help to procure funding. In the commercial world at least, the failed promises of the AI Winter continued to haunt AI research into the 2000s, as the New York Times reported in 2005: "Computer scientists and software engineers avoided the term artificial intelligence for fear of being viewed as wild-eyed dreamers." In 1968, Arthur C. Clarke and Stanley Kubrick had imagined that by the year 2001, a machine would exist with an intelligence that matched or exceeded the capability of human beings. The character they created, HAL 9000, was based on a belief shared by many leading AI researchers that such a machine would exist by the year 2001. In 2001, AI founder Marvin Minsky asked "So the question is why didn't we get HAL in 2001?" Minsky believed that the answer is that the central problems, like commonsense reasoning, were being neglected, while most researchers pursued things like commercial applications of neural nets or genetic algorithms. John McCarthy, on the other hand, still blamed the qualification problem. For Ray Kurzweil, the issue is computer power and, using Moore's Law, he predicted that machines with human-level intelligence will appear by 2029. Jeff Hawkins argued that neural net research ignores the essential properties of the human cortex, preferring simple models that have been successful at solving simple problems. There were many other explanations and for each there was a corresponding research program underway. In the first decades of the 21st century, access to large amounts of data (known as "big data"), faster computers and advanced machine learning techniques were successfully applied to many problems throughout the economy. In fact, McKinsey Global Institute estimated in their famous paper "Big data: The next frontier for innovation, competition, and productivity" that "by 2009, nearly all sectors in the US economy had at least an average of 200 terabytes of stored data". By 2016, the market for AI-related products, hardware, and software reached more than 8 billion dollars, and the New York Times reported that interest in AI had reached a "frenzy". The applications of big data began to reach into other fields as well, such as training models in ecology and for various applications in economics. Advances in deep learning (particularly deep convolutional neural networks and recurrent neural networks) drove progress and research in image and video processing, text analysis, and even speech recognition. Deep learning is a branch of machine learning that models high level abstractions in data by using a deep graph with many processing layers. According to the Universal approximation theorem, deep-ness isn't necessary for a neural network to be able to approximate arbitrary continuous functions. Even so, there are many problems that are common to shallow networks (such as overfitting) that deep networks help avoid. As such, deep neural networks are able to realistically generate much more complex models as compared to their shallow counterparts. However, deep learning has problems of its own. A common problem for recurrent neural networks is the vanishing gradient problem, which is where gradients passed between layers gradually shrink and literally disappear as they are rounded off to zero. There have been many methods developed to approach this problem, such as Long short-term memory units. State-of-the-art deep neural network architectures can sometimes even rival human accuracy in fields like computer vision, specifically on things like the MNIST database, and traffic sign recognition. Language processing engines powered by smart search engines can easily beat humans at answering general trivia questions (such as IBM Watson), and recent developments in deep learning have produced astounding results in competing with humans, in things like Go and Doom (which, being a First-Person Shooter game, has sparked some controversy). Big data refers to a collection of data that cannot be captured, managed, and processed by conventional software tools within a certain time frame. It is a massive amount of decision-making, insight, and process optimization capabilities that require new processing models. In the Big Data Era written by Victor Meyer Schonberg and Kenneth Cooke, big data means that instead of random analysis (sample survey), all data is used for analysis. The 5V characteristics of big data (proposed by IBM): Volume, Velocity, Variety, Value, Veracity. The strategic significance of big data technology is not to master huge data information, but to specialize in these meaningful data. In other words, if big data is likened to an industry, the key to realizing profitability in this industry is to increase the “Process capability” of the data and realize the “Value added” of the data through “Processing”. Artificial intelligence is a branch of computer science that attempts to understand the essence of intelligence and produce a new intelligent machine that responds in a manner similar to human intelligence. Research in this area includes robotics, speech recognition, image recognition, Natural language processing and expert systems. Since the birth of artificial intelligence, the theory and technology have become more and more mature, and the application fields have been expanding. It is conceivable that the technological products brought by artificial intelligence in the future will be the "container" of human wisdom. Artificial intelligence can simulate the information process of human consciousness and thinking. Artificial intelligence is not human intelligence, but it can be like human thinking, and it may exceed human intelligence. Artificial general intelligence is also referred to as "strong AI", "full AI" or as the ability of a machine to perform "general intelligent action". Academic sources reserve "strong AI" to refer to machines capable of experiencing consciousness. ^ McCorduck 2004, pp. 17–25. ^ Quoted in McCorduck 2004, p. 8. Crevier 1993, p. 1 and McCorduck 2004, pp. 6–9 discusses sacred statues. ^ Bonner, Anthonny, The Art and Logic of Ramón Llull: A User's Guide, Brill, 2007. ^ The original photo can be seen in the article: Rose, Allen (April 1946). "Lightning Strikes Mathematics". Popular Science: 83–86. Retrieved 15 April 2012. ^ McCorduck 2004, pp. 51–57, 80–107, Crevier 1993, pp. 27–32, Russell & Norvig 2003, pp. 15, 940, Moravec 1988, p. 3, Cordeschi, 2002 & Chap. 5. ^ McCorduck 2004, p. 98, Crevier 1993, pp. 27–28, Russell & Norvig 2003, pp. 15, 940, Moravec 1988, p. 3, Cordeschi, 2002 & Chap. 5. ^ Norvig & Russell (2003, p. 948) claim that Turing answered all the major objections to AI that have been offered in the years since the paper appeared. ^ See McCarthy et al. 1955. Also see Crevier 1993, p. 48 where Crevier states "[the proposal] later became known as the 'physical symbol systems hypothesis'". The physical symbol system hypothesis was articulated and named by Newell and Simon in their paper on GPS. (Newell & Simon 1963) It includes a more specific definition of a "machine" as an agent that manipulates symbols. See the philosophy of artificial intelligence. ^ McCorduck (2004, pp. 129–130) discusses how the Dartmouth conference alumni dominated the first two decades of AI research, calling them the "invisible college". ^ Crevier (1993, pp. 49) writes "the conference is generally recognized as the official birthdate of the new science." ^ GPS: McCorduck 2004, pp. 245–250, Crevier 1993, p. GPS?, Russell & Norvig 2003, p. GPS? ^ Minsky strongly believes he was misquoted. See McCorduck 2004, pp. 272–274, Crevier 1993, p. 96 and Darrach 1970. ^ McCorduck 2004, p. 131, Crevier 1993, p. 51. McCorduck also notes that funding was mostly under the direction of alumni of the Dartmouth conference of 1956. ^ Crevier 1993, pp. 146–148, see also Buchanan 2005, p. 56: "Early programs were necessarily limited in scope by the size and speed of memory"
^ McCorduck 2004, pp. 280–281, Crevier 1993, p. 110, Russell & Norvig 2003, p. 21 and NRC 1999 under "Success in Speech Recognition". ^ Crevier 1993, p. 117, Russell & Norvig 2003, p. 22, Howe 1994 and see also Lighthill 1973. ^ Crevier 1993, pp. 115–116 (on whom this account is based). Other views include McCorduck 2004, pp. 306–313 and NRC 1999 under "Success in Speech Recognition". ^ Crevier 1993, p. 115. Moravec explains, "Their initial promises to DARPA had been much too optimistic. Of course, what they delivered stopped considerably short of that. But they felt they couldn't in their next proposal promise less than in the first one, so they promised more." ^ NRC 1999 under "Shift to Applied Research Increases Investment." While the autonomous tank was a failure, the battle management system (called "DART") proved to be enormously successful, saving billions in the first Gulf War, repaying the investment and justifying the DARPA's pragmatic policy, at least as far as DARPA was concerned. ^ "I became the only member of the AI community to be seen eating lunch with Dreyfus. And I deliberately made it plain that theirs was not the way to treat a human being." Joseph Weizenbaum, quoted in Crevier 1993, p. 123. ^ An early example of McCathy's position was in the journal Science where he said "This is AI, so we don't care if it's psychologically real" (Kolata 1982), and he recently reiterated his position at the AI@50 conference where he said "Artificial intelligence is not, by definition, simulation of human intelligence" (Maker 2006). ^ Neat vs. scruffy: McCorduck 2004, pp. 421–424 (who picks up the state of the debate in 1984). Crevier 1993, pp. 168 (who documents Schank's original use of the term). Another aspect of the conflict was called "the procedural/declarative distinction" but did not prove to be influential in later AI research. ^ McCorduck 2004, pp. 305–306, Crevier 1993, pp. 170–173, 246 and Russell & Norvig 2003, p. 24. Minsky's frame paper: Minsky 1974. ^ "Chess: Checkmate" (PDF). Retrieved 1 September 2007. ^ Crevier 1993, pp. 240. ^ McCorduck 2004, pp. 426–432, NRC 1999 under "Shift to Applied Research Increases Investment"
^ Crevier 1993, pp. 214–215. ^ Crevier 1993, pp. 215–216. ^ Crevier 1993, pp. 203. AI winter was first used as the title of a seminar on the subject for the Association for the Advancement of Artificial Intelligence. ^ a b McCorduck 2004, p. 441, Crevier 1993, p. 212. McCorduck writes "Two and a half decades later, we can see that the Japanese didn't quite meet all of those ambitious goals." ^ Newquist, HP (1994). The Brain Makers: Genius, Ego, And Greed In The Quest For Machines That Think. New York: Macmillan/SAMS. ISBN 978-0-672-30412-5. ^ Moravec (1988, p. 20) writes: "I am confident that this bottom-up route to artificial intelligence will one date meet the traditional top-down route more than half way, ready to provide the real world competence and the commonsense knowledge that has been so frustratingly elusive in reasoning programs. Fully intelligent machines will result when the metaphorical golden spike is driven uniting the two efforts." ^ Crevier 1993, pp. 183–190. ^ McCorduck (2004, p. 424) discusses the fragmentation and the abandonment of AI's original goals. ^ "Deep Blue". IBM Research. Retrieved 10 September 2010. ^ Markoff, John (16 February 2011). "On 'Jeopardy!' Watson Win Is All but Trivial". The New York Times. ^ Kurzweil 2005, p. 274 writes that the improvement in computer chess, "according to common wisdom, is governed only by the brute force expansion of computer hardware." ^ Cycle time of Ferranti Mark 1 was 1.2 milliseconds, which is arguably equivalent to about 833 flops. Deep Blue ran at 11.38 gigaflops (and this does not even take into account Deep Blue's special-purpose hardware for chess). Very approximately, these differ by a factor of 10^7. ^ Carl Hewitt's Actor model anticipated the modern definition of intelligent agents. (Hewitt, Bishop & Steiger 1973) Both John Doyle (Doyle 1983) and Marvin Minsky's popular classic The Society of Mind (Minsky 1986) used the word "agent". Other "modular" proposals included Rodney Brook's subsumption architecture, object-oriented programming and others. ^ McCorduck (2004, p. 487): "As I write, AI enjoys a Neat hegemony." ^ Hampton, Stephanie E; Strasser, Carly A; Tewksbury, Joshua J; Gram, Wendy K; Budden, Amber E; Batcheller, Archer L; Duke, Clifford S; Porter, John H (1 April 2013). "Big data and the future of ecology". Frontiers in Ecology and the Environment. 11 (3): 156–162. doi:10.1890/120103. ISSN 1540-9309. ^ "How Big Data is Changing Economies | Becker Friedman Institute". bfi.uchicago.edu. Retrieved 9 June 2017. ^ a b LeCun, Yann; Bengio, Yoshua; Hinton, Geoffrey (2015). "Deep learning". Nature. 521 (7553): 436–444. Bibcode:2015Natur.521..436L. doi:10.1038/nature14539. PMID 26017442. ^ Baral, Chitta; Fuentes, Olac; Kreinovich, Vladik (June 2015). "Why Deep Neural Networks: A Possible Theoretical Explanation". Departmental Technical Reports (Cs). Retrieved 9 June 2017. ^ Ciregan, D.; Meier, U.; Schmidhuber, J. (June 2012). Multi-column deep neural networks for image classification. 2012 IEEE Conference on Computer Vision and Pattern Recognition. pp. 3642–3649. arXiv:1202.2745. CiteSeerX 10.1.1.300.3283. doi:10.1109/cvpr.2012.6248110. ISBN 978-1-4673-1228-8. ^ Markoff, John (16 February 2011). "On 'Jeopardy!' Watson Win Is All but Trivial". The New York Times. ISSN 0362-4331. Retrieved 10 June 2017. ^ "AlphaGo: Mastering the ancient game of Go with Machine Learning". Research Blog. Retrieved 10 June 2017. ^ "Innovations of AlphaGo | DeepMind". DeepMind. Retrieved 10 June 2017. ^ University, Carnegie Mellon. "Computer Out-Plays Humans in "Doom"-CMU News - Carnegie Mellon University". www.cmu.edu. Retrieved 10 June 2017. Berlinski, David (2000), The Advent of the Algorithm, Harcourt Books, ISBN 978-0-15-601391-8, OCLC 46890682 . Buchanan, Bruce G. (Winter 2005), "A (Very) Brief History of Artificial Intelligence" (PDF), AI Magazine, pp. 53–60, archived from the original (PDF) on 26 December 2007, retrieved 30 August 2007 . Brooks, Rodney (1990), "Elephants Don't Play Chess" (PDF), Robotics and Autonomous Systems, 6 (1–2): 3–15, CiteSeerX 10.1.1.588.7539, doi:10.1016/S0921-8890(05)80025-9, retrieved 30 August 2007 . Butler, Samuel (13 June 1863), "Darwin Among the Machines", the Press, Christchurch, New Zealand, retrieved 10 October 2008 . Colby, Kenneth M.; Watt, James B.; Gilbert, John P. (1966), "A Computer Method of Psychotherapy: Preliminary Communication", The Journal of Nervous and Mental Disease, vol. 142 no. 2, pp. 148–152, retrieved 17 June 2018 . Colby, Kenneth M. (September 1974), Ten Criticisms of Parry (PDF), Stanford Artificial Intelligence Laboratory, REPORT NO. STAN-CS-74-457, retrieved 17 June 2018 . CNN (26 July 2006), AI set to exceed human brain power, CNN.com, retrieved 16 October 2007 . Copeland, Jack (2000), Micro-World AI, retrieved 8 October 2008 . Cordeschi, Roberto (2002), The Discovery of the Artificial, Dordrecht: Kluwer. .
Darrach, Brad (20 November 1970), "Meet Shaky, the First Electronic Person", Life Magazine, pp. 58–68 . Doyle, J. (1983), "What is rational psychology? Toward a modern mental philosophy", AI Magazine, vol. 4 no. 3, pp. 50–53 . Dreyfus, Hubert (1965), Alchemy and AI, RAND Corporation Memo . Dreyfus, Hubert (1972), What Computers Can't Do, New York: MIT Press, ISBN 978-0-06-090613-9, OCLC 5056816 . The Economist (7 June 2007), "Are You Talking to Me? ", The Economist, retrieved 16 October 2008 . Feigenbaum, Edward A.; McCorduck, Pamela (1983), The Fifth Generation: Artificial Intelligence and Japan's Computer Challenge to the World, Michael Joseph, ISBN 978-0-7181-2401-4 . Hawkins, Jeff; Blakeslee, Sandra (2004), On Intelligence, New York, NY: Owl Books, ISBN 978-0-8050-7853-4, OCLC 61273290 . Hebb, D.O. (1949), The Organization of Behavior, New York: Wiley, ISBN 978-0-8058-4300-2, OCLC 48871099 . Hobbes, Thomas (1651), Leviathan . Hofstadter, Douglas (1999) , Gödel, Escher, Bach: an Eternal Golden Braid, Basic Books, ISBN 978-0-465-02656-2, OCLC 225590743 . Howe, J. (November 1994), Artificial Intelligence at Edinburgh University: a Perspective, retrieved 30 August 2007 . Kaplan, Andreas; Haenlein, Michael (2018), "Siri, Siri in my Hand, who's the Fairest in the Land? On the Interpretations, Illustrations and Implications of Artificial Intelligence", Business Horizons, 62: 15–25, doi:10.1016/j.bushor.2018.08.004, retrieved 25 November 2018 . Kolata, G. (1982), "How can computers get common sense? ", Science, 217 (4566): 1237–1238, Bibcode:1982Sci...217.1237K, doi:10.1126/science.217.4566.1237, PMID 17837639 . Kurzweil, Ray (2005), The Singularity is Near, Viking Press, ISBN 978-0-14-303788-0, OCLC 71826177 . Lakoff, George (1987), Women, Fire, and Dangerous Things: What Categories Reveal About the Mind, University of Chicago Press., ISBN 978-0-226-46804-4 . Lenat, Douglas; Guha, R. V. (1989), Building Large Knowledge-Based Systems, Addison-Wesley, ISBN 978-0-201-51752-1, OCLC 19981533 . Levitt, Gerald M. (2000), The Turk, Chess Automaton, Jefferson, N.C.: McFarland, ISBN 978-0-7864-0778-1 . McCorduck, Pamela (2004), Machines Who Think (2nd ed. ), Natick, MA: A. K. Peters, Ltd., ISBN 978-1-56881-205-2, OCLC 52197627 . Olsen, Stefanie (10 May 2004), Newsmaker: Google's man behind the curtain, CNET, retrieved 17 October 2008 . Olsen, Stefanie (18 August 2006), Spying an intelligent search engine, CNET, retrieved 17 October 2008 . Pearl, J. (1988), Probabilistic Reasoning in Intelligent Systems: Networks of Plausible Inference, San Mateo, California: Morgan Kaufmann, ISBN 978-1-55860-479-7, OCLC 249625842 . Poole, David; Mackworth, Alan; Goebel, Randy (1998), Computational Intelligence: A Logical Approach, Oxford University Press., ISBN 978-0-19-510270-3 . Samuel, Arthur L. (July 1959), "Some studies in machine learning using the game of checkers", IBM Journal of Research and Development, 3 (3): 210–219, CiteSeerX 10.1.1.368.2254, doi:10.1147/rd.33.0210, retrieved 20 August 2007 . Searle, John (1980), "Minds, Brains and Programs", Behavioral and Brain Sciences, 3 (3): 417–457, doi:10.1017/S0140525X00005756, retrieved 13 May 2009 . Simon, H. A.; Newell, Allen (1958), "Heuristic Problem Solving: The Next Advance in Operations Research", Operations Research, 6: 1, doi:10.1287/opre.6.1.1 . Simon, H. A. (1965), The Shape of Automation for Men and Management, New York: Harper & Row . Skillings, Jonathan (2006), Newsmaker: Getting machines to think like us, CNET, retrieved 8 October 2008 . Tascarella, Patty (14 August 2006), "Robotics firms find fundraising struggle, with venture capital shy", Pittsburgh Business Times, retrieved 15 March 2016 . Turing, Alan (1936–37), "On Computable Numbers, with an Application to the Entscheidungsproblem", Proceedings of the London Mathematical Society, 2 (42): 230–265, doi:10.1112/plms/s2-42.1.230, retrieved 8 October 2008 . Weizenbaum, Joseph (1976), Computer Power and Human Reason, W.H. Freeman & Company, ISBN 978-0-14-022535-8, OCLC 10952283 .